Do you want to make money doing what you love? 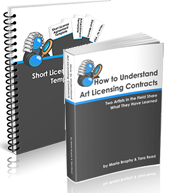 Do you want to learn about the world of art licensing? Do you enjoying learning in group sessions? While each artist’s path to earning an income in art licensing will be as unique as their art, there are disciplines and business strategies that can be taught to help shorten your learning curve. Our ART LICENSING ACADEMY is a group coaching program that allows artists access to information, support, and inspiration in their quest for knowledge about the art licensing industry. Succeeding in art licensing – or any business for that matter – requires more than just the core skills or talent. In art licensing, the “core skill” would obviously be artistic talent. If you have the talent, you then need to learn how to apply it in a way that works for the sale of products. You need to learn to see trends and decide if they make sense for your style and focus. Beyond the core skills, you need business skills – sale and marketing, building and nurturing relationships, understanding and negotiating contracts, etc. And don’t forget about your “personal core.” Without understanding yourself and what motivates you, you won’t have everything you need to maximize your success. Our ART LICENSING ACADEMY has been designed to support you and help you grow in all core skills. By working together for four weeks, we are able to cover a lot of how-to’s, as well as personal development and mindset concepts that are the backbone to a sustainable business. You will get answers to your questions and learn from the questions asked by others as well. Our private Facebook group is an amazing way to stay connected and supported throughout the program and beyond. If you are ready to challenge yourself, stretch your comfort zone and learn new ways of thinking and creating, our ART LICENSING ACADEMY is for you! ART LICENSING ACADEMY is affordable, effective and highly informational! 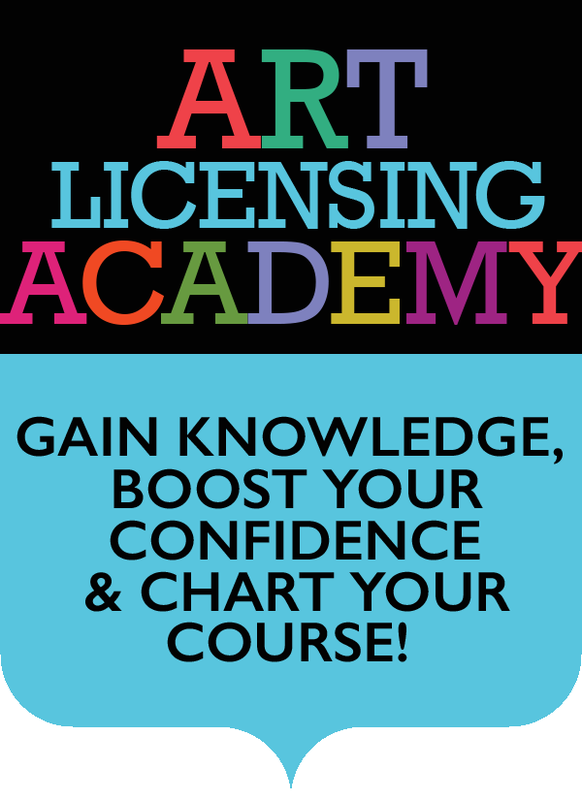 What is the ART LICENSING ACADEMY? This is a four week series of weekly hour-long training sessions and weekly “Q & A” sessions – all conducted by phone – so no travel is involved. After our month together you will have a better understanding of what it takes to license your art. You will learn how to create art that is fit for licensing, and how to get the right eyes on your designs. You will learn to promote your work professionally and understand the basic legal issues that can make or break your business. You will learn how to promote your own art, or seek an agent if that is your desire. The four seek series is broken down as follows . . .
You and Your Art. Focus on mindsets for success, building a plan for your business and organizing your portfolio for licensing. Learn to design in a way that increases your chances of getting licensing deals. Who You Are and How to Promote Yourself. Get clear about what makes you unique and how to communicate your message – in person, by phone, online and more. Gain confidence to talk to manufacturers or approach an agent. Time Management, Marketing and Nourishing Your Network. Focus on creating supportive habits, how to market your art and building a solid network and environment to set yourself up for success. The Legal Side of Art Licensing. Contracts are the cornerstone of how business is done in art licensing, and you can severely cripple your business if you don’t understand what you are signing and how to negotiate a win-win deal. Critical to this will be the understanding of copyrights. Each session is conducted by phone, so you can live anywhere in the world and be a part of the ART LICENSING ACADEMY. All sessions are recorded and replays will be available for participants to have for their personal licensing libraries. There are two hour-long sessions per week for four weeks: one training session and one Q & A session. During the training sessions, you will be given the tools and strategies you can put into action right away. During the Q & A sessions, anyone in the group can bring questions to the call and ask them live. If you live outside the U.S., you can be a part of our ART LICENSING ACADEMY! All sessions are recorded so you don’t have to call in to listen live – especially for the training sessions. As for the Q & A sessions, you are welcome to email your questions ahead of time and we will include them in the call. You will be able to listen to the answers to your questions, and everyone’s questions/answers on the audio replay. As for the Facebook group, artists can participate regardless of their geographic location. In addition to the training and Q & A sessions, there will be a private Facebook Group where you can connect with other ART LICENSING ACADEMY artists. Share experiences, ask questions and support each other’s journey through this process. You get 4 hours of solid training, 4+ hours of live Q & A, a Facebook Group where you can ask more questions and connect. The program is valued at $797.00, but is being offered to you for only $497.00 (payable as a lump sum, or in three easy payments of $174 every 2 weeks – beginning the day you register). In addition to the eight sessions in the series, you will receive the following bonuses when you attend our ART LICENSING ACADEMY . . . ART LICENSING ACADEMY Companion PDF Workbook ($87 value) “The Goal Wheel for Artists” – eBook, teleseminar replay and 12 monthly follow-up emails ($42 value) “Beginner Basics Teleseminar Replay” ($20 value) Total Value of the Bonuses = $149 value In Addition to these free bonuses, we are also offering you a discount on our CONTRACTS products simply by registering for the Academy! Save $20 – $40 off these two highly informative eBooks . . .
Click on the links to learn about these great sources of information! To get the discounted price, add them to your cart when you sign up for the ART LICENSING ACADEMY. Private coaching options exclusively for ART LICENSING ACADEMY artists!! Artists in the ART LICENSING ACADEMY group program receive special pricing on private coaching sessions. On occasion items may come up that you want to brainstorm, or discuss privately, or have completely focused on you, and not have this as a group discussion. More information about these sessions will be shared after the first call! I’m really enjoying the information in this course. This is the best $500 I’ve spent in a LONG time. Thank you for planting the seed and making me think about my brand. I have updated my logo and website to better represent who I am, what I do and where I want my business to go. Because of this course, I’m getting a more professional outlook and getting busy actually doing things to make progress. I have always dreamt of doing it but now I AM.